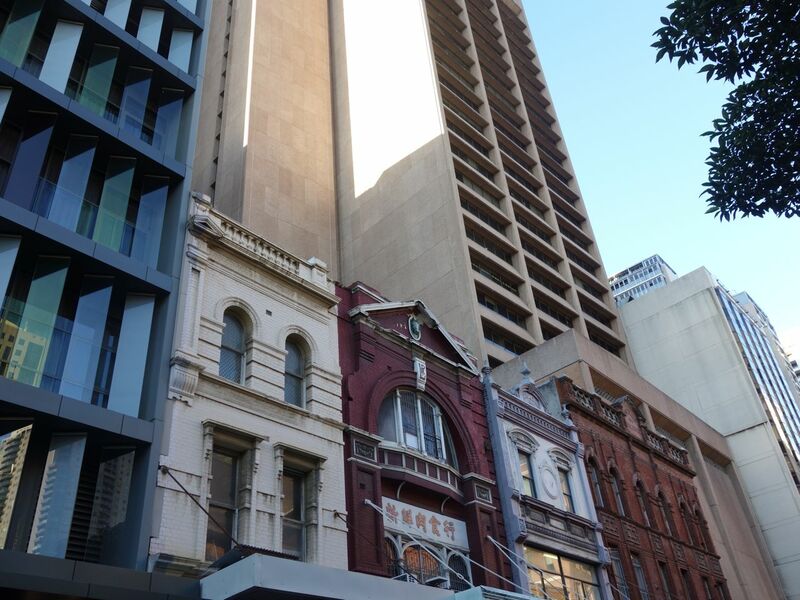 The row of 19th century buildings at the start of Campbell Street are surrounded by more recent, taller buildings, like a piece has been cut out of the modern city to reveal a past version. The row is a miscellany, each building different. On street level there is a string of Thai groceries with displays of pickled grapes and dried bananas, and posters for the grand opening of a new Crocodile Junior restaurant (Crocodile Senior is around the corner on George Street). Number 14 Campbell Street is a butchery, with cuts of meat laid out in the window. If you find yourself here, stand back and look up, above the butchery and the two levels of barred windows on the upper storeys. The building is painted a liverish red, with white details. It is further decorated by three entwined letters – PRL – in a crest and, at the very top, a wild-eyed horse. The Campbell Street Horse is captured in motion, ears alert, nostrils flaring, mane tossed by the wind. Its eyes are spirals of black paint against the pale, verdigris green, and it watches the city around it warily. It looks over at the outlines of the claw machines inside Purikura Photoland across the street. The horse has seen plenty of amusement fads come and go. Beside Photoland is the Capitol Theatre, a building the horse would have known in its days first as a market, and then a Hippodrome in the 1910s. Under a retractable stage the Hippodrome, run by Wirth’s Circus, had a concrete pool for aquatic shows, sometimes featuring seals and polar bears, other times King Neptune and his attendants. The horse’s presence on 14 Campbell Street is something of a mystery. 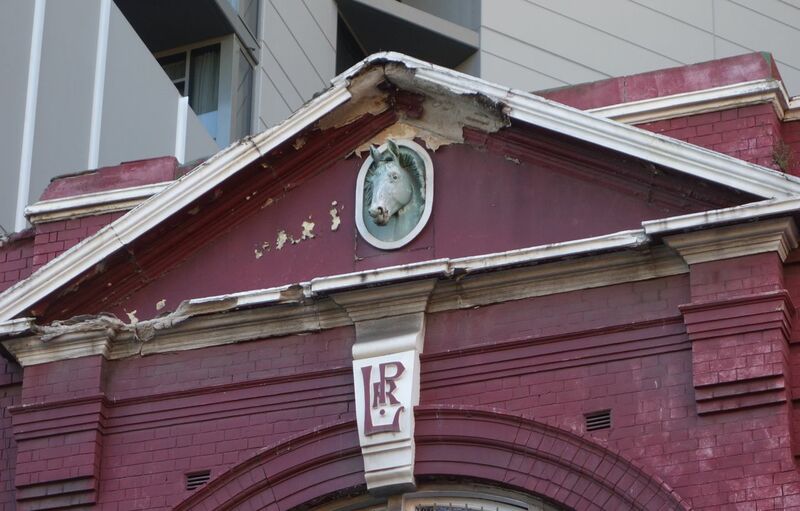 Myself and fellow Sydney scrutineer David Lever have puzzled over it again anew in the past few weeks, wondering what could have led it to be the mascot of this building. We followed the building’s previous identities, beginning around 1888 as a pub called the New Haymarket Hotel, then becoming the Nottingham Castle and then the Capitol Hotel. I found plenty of stories of interest, none of which were about horses. There were various accounts of woe and misfortune that took place at the hotel over the years: a man’s death after a fire caused by him smoking in bed, the death of a lion tamer named James Lindo, the arrests of swindlers and rogues. The heritage report on the row of terraces has plenty of information, describing Number 14 as “highly unusual” with “no comparable examples within the City of Sydney”. As compelling as this is, there is still no mention of the horse. The initials in the crest were of the man who’d had the buildings constructed, P.R. Larkin. Larkin was known as a publican and liquor wholesaler on George Street. There are plenty of cheerful turn of the century descriptions of the “huge casks filled with spirits fit for the gods” at Larkin’s, but no mention of horses. In those days, though, horses were everyday creatures. The streets were full of horses and carts, people travelled by horse bus, and “block boys” had the dangerous and unenviable job of dashing out into the busy streets to sweep up the horse manure. They would have been busy: at the peak of Australia’s horse population there was one horse for every two people. The Campbell Street horse is one of a small number of city horses, statues most of them, of the bronze, memorial kind, as well as the weirder, rooftop kind. Look up at the corner of King and Castlereagh Streets! But back to Campbell Street, and our mystery horse. Campbell was once one of the boundary streets of the market district of Haymarket. In 1929, a newspaper article was published in the Sydney Morning Herald in which a man named Mr Alfred Byrne remembered the days in the 1850s when wild horses would be brought in for auction. Alfred would join the crowds who clustered around to watch the men trying to catch the horses, especially if it were rainy, and “the men holding on to the horses would be dragged ingloriously through thick mud”. So perhaps the Campbell Street Horse is the last of Sydney’s wild horses, captured in perpetual vigour, turning a fierce eye to the ever-growing city.